Watching the sunset in Eden park while waiting for the hot air balloons to set up. 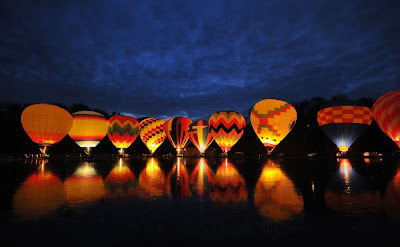 Takes them about 1 hour to get all 12 balloons in place and glowing. It was a cold night and is starting out to be a cold winter. Not much of a autumn this year. I am sure it is a fluke or climate change or *gasp nature. Did this one for b. schlake who does some very nice sunrise and sunset works of art. Taken last evening as the show was about to begin. This is looking west toward downtown. I liked the lone balloon with the sky and tree line. 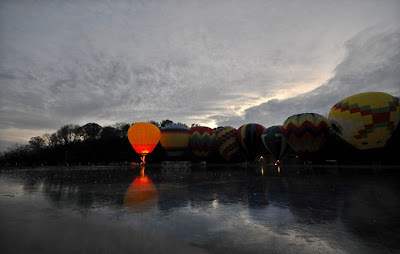 Was one of many shots before the full balloon glows. Cleaned out the gutters today and get things on the deck ready for winter. Still a few things to do. Was cold last few days, got into the low 40s today here. Warm enough to get on the roof and prep it and the fore mentioned gutters. Balluminaria - Eden Park Balloon Glow Cincinnati Ohio. A cold night and the Mirror lake was frozen this year. I think my feet are still frozen. I took both my D200 and used a 18-200mm vr lens on it and put the D300 with the Sigma 10-20 mm and on a tripod. The D200 did well and what picture the D300 took were all excellent. Only problem twice it would not click, no shutter, I tried refocus and miss many good shots. I do not know if it was the cold or the light and camera settings or something else. 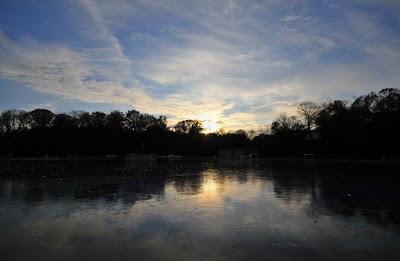 There was a bit of a brezze and the lake was frozen so the mirror effect was different this time. When Insults Were Civil, Most Times. 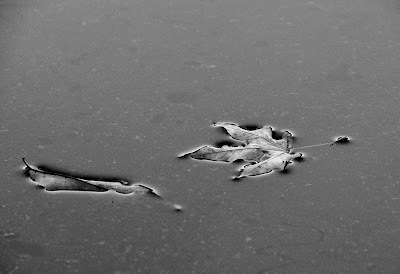 End of a Short Season of Leaf Photos. 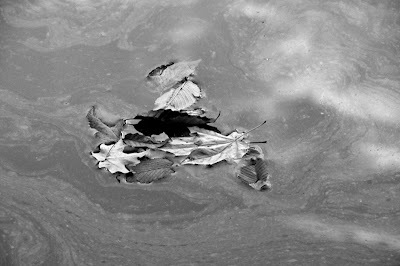 The hurricane winds in September took out many of the tree leaves. I did try some pure digital B&W shots this year, wanted to play around a bit. This is one I took on a warm November afternoon evening. November 14, 2008 was World Diabetes Day and the project included the 5/3 Building and Tyler Davidson Fountain in Downtown Cincinnati, Ohio. The idea is to get picture of hundreds of icon buildings and structures all over the world photographed in Blue on that day. 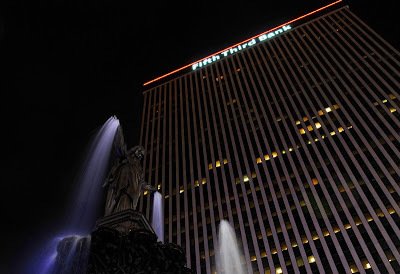 I set out last night to capture the building and fountain last night. It was going to be the last warm night of the season as a cold front was approaching. The square was full of Holiday items like the skating rink and the huge Christmas tree. 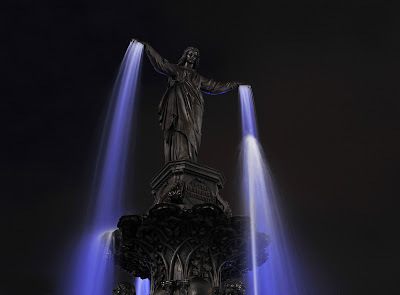 I was hoping the City of Cincinnati was going to put blue lights in the fountain but settled on the glow of blue light off the building behind the fountain. There were no other photographers there last night so I guess this is it for the project. The night was pleasant and I was able to park close so I did not have to walk far with my gear. I sent the pictures along to the project and I hope folks enjoy the end result. Last week at Lake Powell Crosley, it is always nice when the trees are turning. Most of the leaves are gone now. Winter is coming soon the winds felt cold tonight, a bit more of a chill than it has been up till now. Time to try and relax. Rowe woods is one of my favorite places to walk the trails. It looked in full autumn color last week end. Wind and some rain this week has taken much of that way this week end. 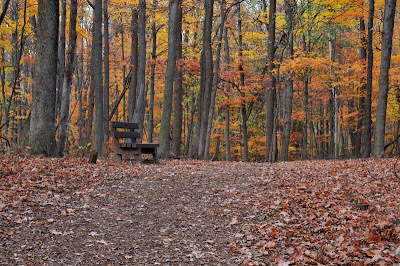 I will make another walk in the woods when I get home from the CNE band dinner in the afternoon. I seldom stop here and sit, unless I have a lot of time on my hands. 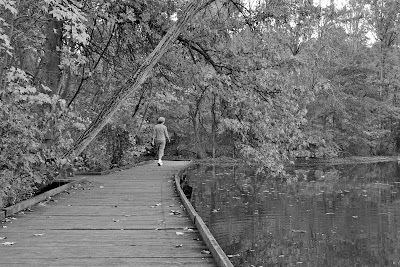 This is between the east lake shelter house and the wooden walkway on the west side of Powell Crosley Lake in Rowe Woods. Last Meeting - Spring will be new begining. The voters have spoken, not sure if it all was legit with how some people signed up and voted. But I do not think they make a difference. As much as I have read so far of the final returns. Some people just stayed home and some new folks got out and voted. We will see if Deeds is what proves out or the words. Time will tell. I went back to Rowe Woods today to get a few leaf pictures. I saw the portrait photographer lady there again with some clients. 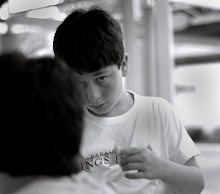 It is a great place to take some relaxed natural looking portraits. The clouds were thick and there seemed to be some sort of light smoke in the air. Like maybe first west of us, I have to check the news. 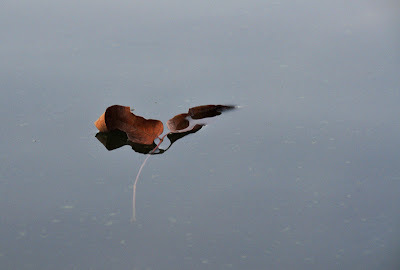 This is where I often take pictures of leaves, off this small dock area. 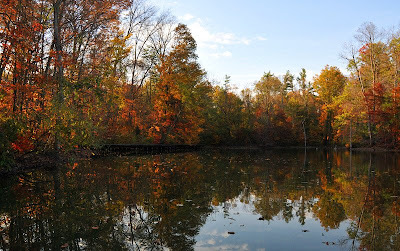 Went to Powell Crosley Lake today in Rowe Woods, it is my favorite time of the year to visit and walk through the woodlands. 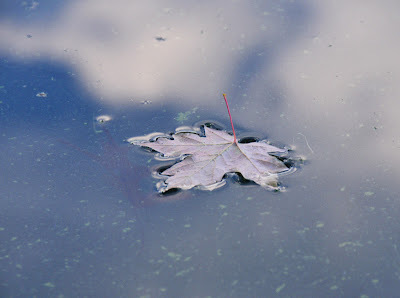 I started taking pictures of floating leaves there in 2006. 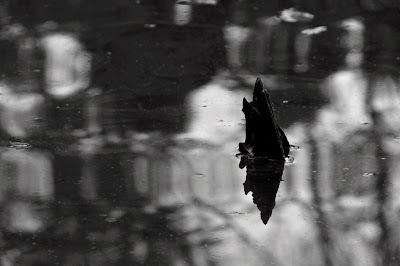 I went to take pictures of wood ducks and ended up taking pictures of surface tension of falling leaves on the lake water. It has become a yearly tradition. The lake had a lot of moss on it this evening, we have been in a drought so the lake is low. Plan on talking a couple walks tomorrow, this time with both cameras and a tripod.